Just how much does Broward College ask for tuition today, and how much is tuition estimated to change? How does this compare to other schools? Keep reading to find out. How Much Will Tuition Increase? Get a good understanding of the tuition charges associated with Broward College in order to prepare effectively for the next 4-6 years. Check out the figures below to understand how Broward College's cost compares to other schools and if you should prepare for tuition increases. How Does Broward College Contrast With Other Schools? For nationwide, regional and statewide comparisons, look at the following table to see how Broward College measures up to other schools. Broward College fees and tuition is dramatically lowered for residents of Florida. For in-state students, tuition and fees is set at $2,830 for the 2017 - 2018 year, 68.4% off the price charged to out-of-state students. Tuition is $1,968 and fees $862. Broward College out-of-state students paid $8,952 in tuition and fees in 2017 - 2018. $6,984 was charged for fees, and $1,968 was for tuition. The following table outlines the costs defined above for the 2017 - 2018 academic year. Tuition and Fees for out-of-state students attending Broward College grew at an average yearly rate of 0.4% within the last 5 years. In the same time period, tuition grew by 0.6% and fees grew by 0.4%. Based on this, we estimate the cost of tuition and fees this year will total $8,990. For a two-year degree, we estimate tuition and fees will be $18,020 and for a four year degree to be $36,195. This does not cover additional charges such as room and board, books, and transportation. 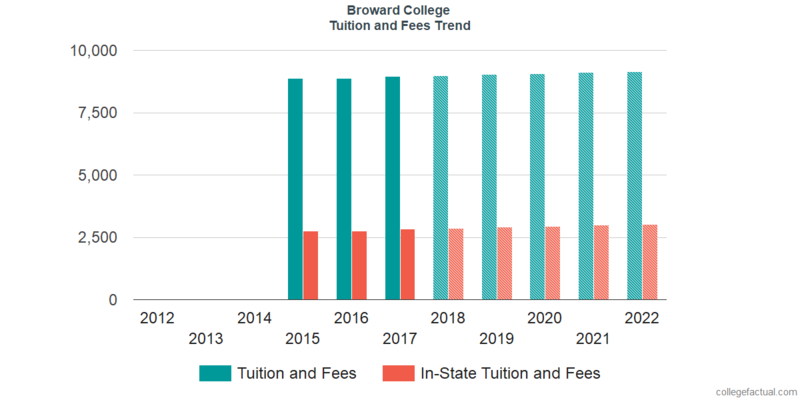 The following chart shows estimated future tuition and fees which includes residency based discounts for undergraduate students at Broward College.